Defence Ministry Secretary Gotabaya Rajapaksa, Secretary to the Ministry of Law and Order Maj. Gen. (Rtd) Nanda Mallawarachchi and the Commanders of the Tri Forces at the inaugural session. Customs officials at the Bandaranaike International Airport took in for questioning a local who tried to smuggle two slabs of gold worth over Rs.1 million on Friday evening, Customs sources said. The suspect, a resident of Kandana was about to take flight to Chennai when he was nabbed by Customs officials who were suspicious of his movements. 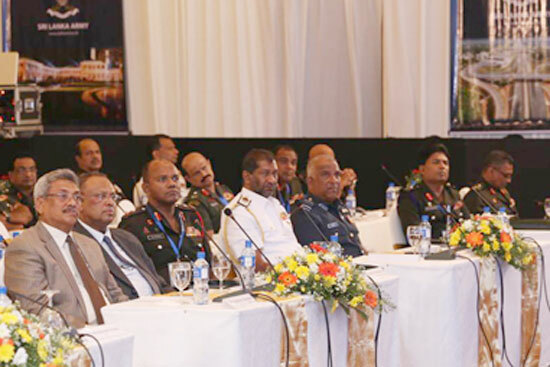 Themed on 'Sri Lanka: Challenges to a rising nation' the meticulously organised Defence Seminar 2014 was held last week for a full three days. It was a forum of eminent scholars, intellectuals, policy-makers, security chiefs, think-tanks of different spheres. Sri Lanka is a present day model of how nations could blend security and development together to provide a better life for its people, the Commander of Army Lieutenant General Daya Ratnayake said.